EARN UP TO $1,000 NOW - If you have any information about this crime or any person(s) involved, you are urged to call us immediately at 972-436-TIPS (8477) or to submit a Web Tip. You do not have to give your name. At approximately 11:15am on Thursday 9/7/17, the pictured suspect stole several canisters of baby formula from Tom Thumb located at 106 N. Denton Tap Rd. in Coppell. The suspect drove away in a 2-door black Dodge Ram pickup truck with a black rear bumper and a sticker on the lower left of the rear window. The suspect is described as a white female with blonde hair, approximately 5`6" tall and 180 lbs. 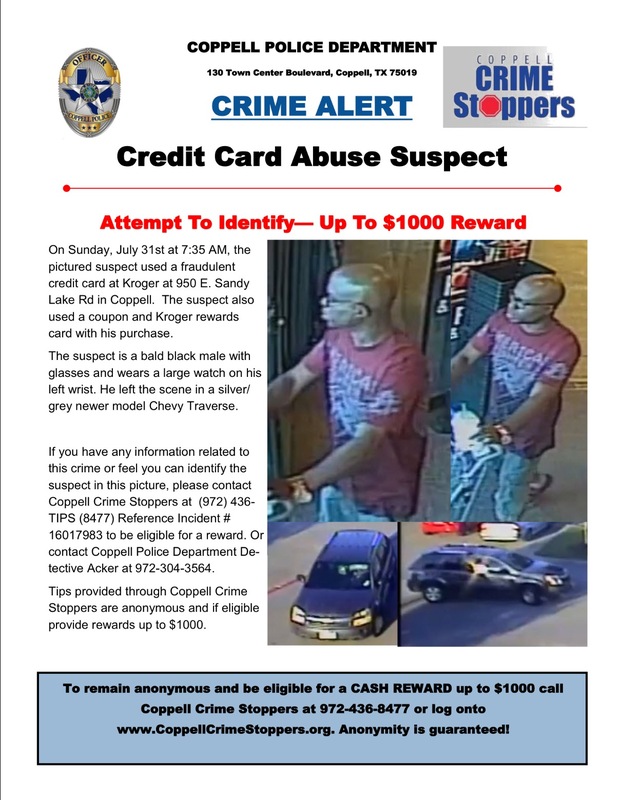 If you feel you can identify this suspect, please contact Coppell Crime Stoppers at 972-436-TIPS (8477) or text "CCSTIP plus your message" to 274637 (CRIMES). 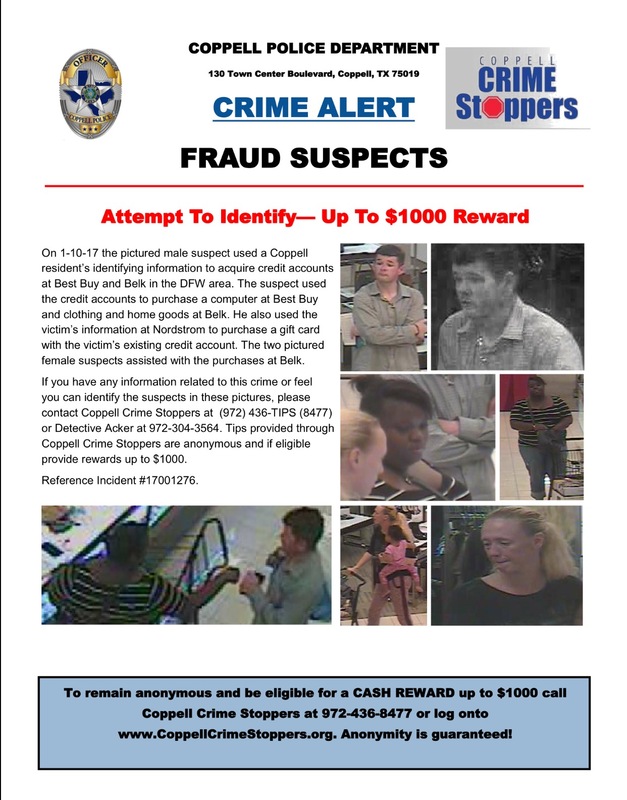 Tips provided through Coppell Crime Stoppers are anonymous and if eligible, provide rewards up to $1,000. 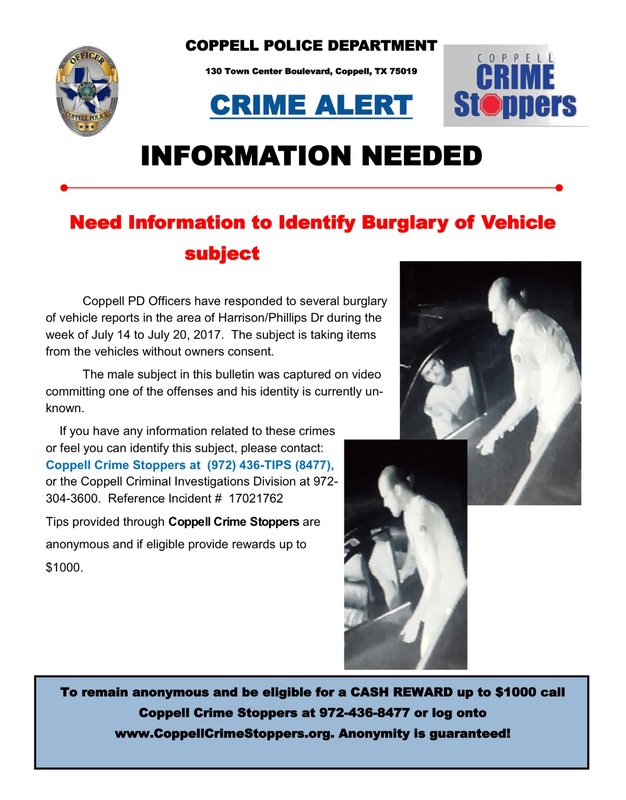 Coppell PD Officers have responded to several burglary of vehicle reports in the area of Harrison/Phillips Drive during the week of July 14-20th, 2017. The subject is taking items from the vehicles without the owners` consent. 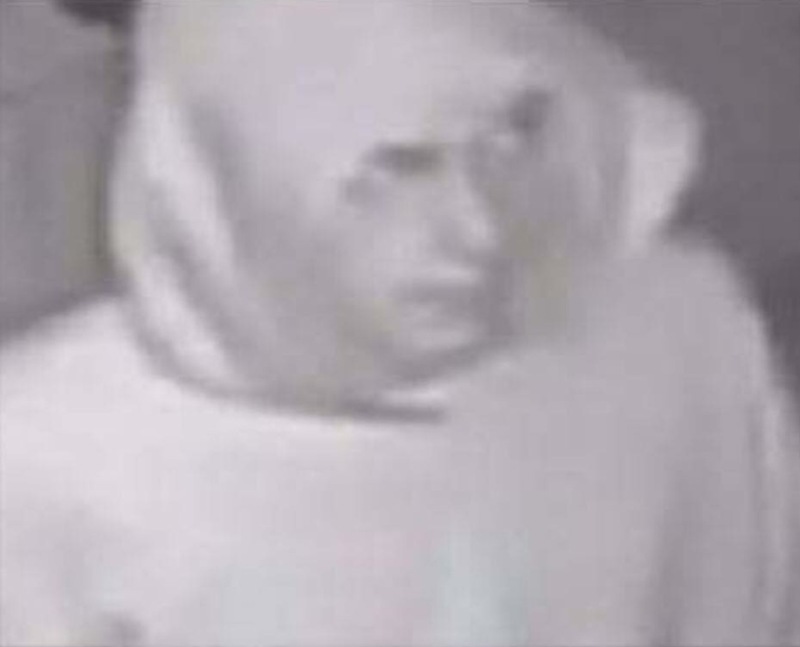 The male subject pictured in the bulletin was captured on video committing one of the offenses, and his identity is currently unknown. 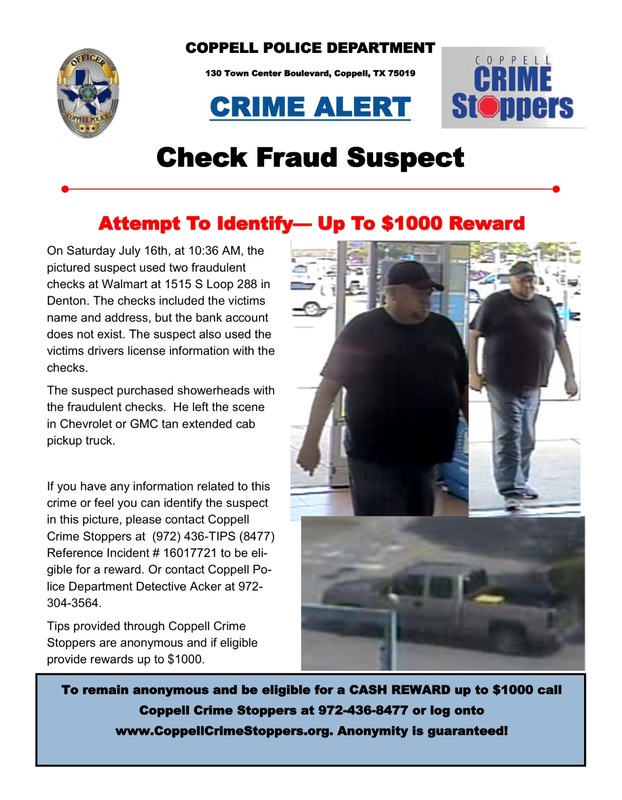 If you have any information related to these crimes or feel you can identify this suspect, please contact Coppell Crime Stoppers at 972-436-TIPS (8477) or text "CCSTIP plus your message" to 274637 (CRIMES). On the evening of July 1,2017, Coppell PD responded to two reports of Burglary of a Vehicle at a local City Park. In both cases, a ladies purse was stolen. One of the purses contained multiple credit cards, and the cards were used at various locations in the DFW area. The two males shown are person f interest n these cases. They were captured on video at a location where one of the cards was used. 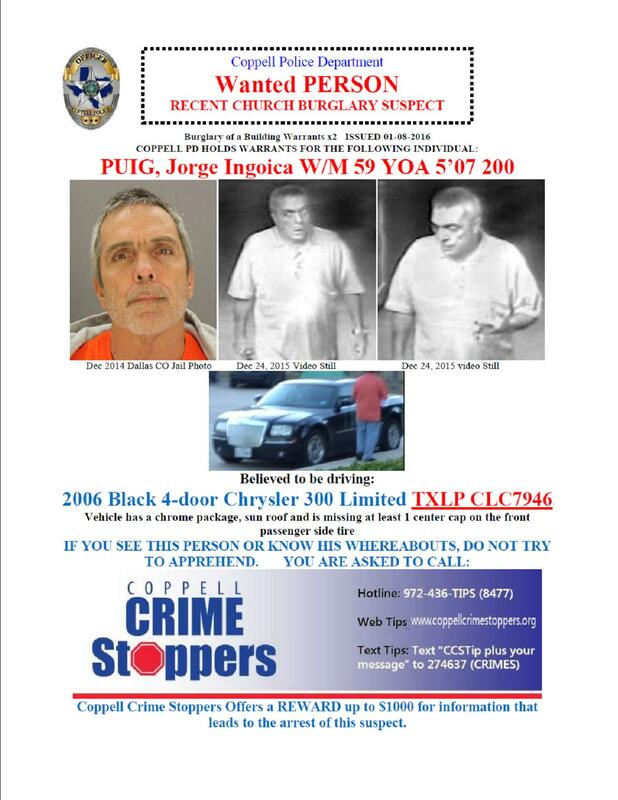 If you have any information related to these crimes or feel you can identify a suspect or suspects, please contact Coppell Crime Stoppers at 972-436-TIPS (8477) or text "CCSTIP plus your message" to 274637 (CRIMES). On 4/18/17 at approximately 6:24pm, Coppell PD Officers were dispatched to Coppell High School in reference to a robbery in progress. Upon arrival, officers discovered that a juvenile was robbed at gunpoint from an unknown suspect. The juvenile victim stated to police that the suspect pulled up in a newer silver Nissan Sentra and asked him a few questions before brandishing and pointing some type of handgun at the victim. The suspect demanded the victim’s cell phone and wallet. The victim complied, and the suspect then drove away. The suspect is described as a Hispanic/Latin male, between 25-35 years old, with a goatee. The suspect was wearing a dark colored shirt, possibly a Nike brand with some type of writing. 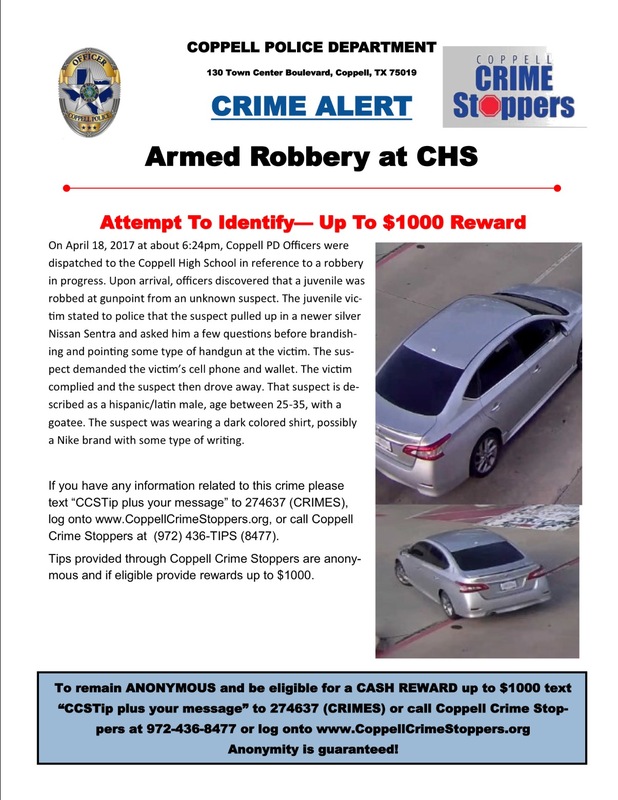 If you have any information related to this crime, please contact Coppell Crime Stoppers at 972-436-TIPS (8477) or text "CCSTIP plus your message" to 274637 (CRIMES), or submit a tip online through TipSoft at www.coppellcrimestoppers.org. The pictured suspect is responsible for up to 75 different vehicle burglaries in Coppell since November 2016. The suspect is described as a white male approximately 17-21 years old and 6` tall with a thin build. He wears a grey or light colored hoodie in all of the offenses. The suspect walks through neighborhoods, mostly on the west side of Coppell, and pulls on door handles of cars parked in the street or in the driveway. When a car is unlocked, he takes anything of value left inside the car. The suspect has taken purses, laptops, firearms, loose change, wallets, cell phones, sunglasses and other items from vehicles that have been left unlocked. The suspect likely lives in the area around Wilson Elementary School. If you have any information related to this crime or feel you can identify the suspect in these pictures, please contact Coppell Crime Stoppers at 972-436-TIPS (8477). On 1/10/17, the pictured male suspect used a Coppell resident`s identifying information to acquire credit accounts at Best Buy and Belk in the DFW area. The suspect used the credit accounts to purchase a computer at Best Buy and clothing and home goods at Belk. He also used the victim`s information at Nordstrom to purchase a gift card with the victim`s existing credit account. The two pictured female suspects assisted with the purchases at Belk. In a related residential security video later that night, three males are seen walking in the streets checking for unlocked cars. If you have any information related to this crime or feel you can identify the suspects in these pictures, please contact Coppell Crime Stoppers at 972-436-TIPS (8477) or Detective Acker at 972-304-3564. 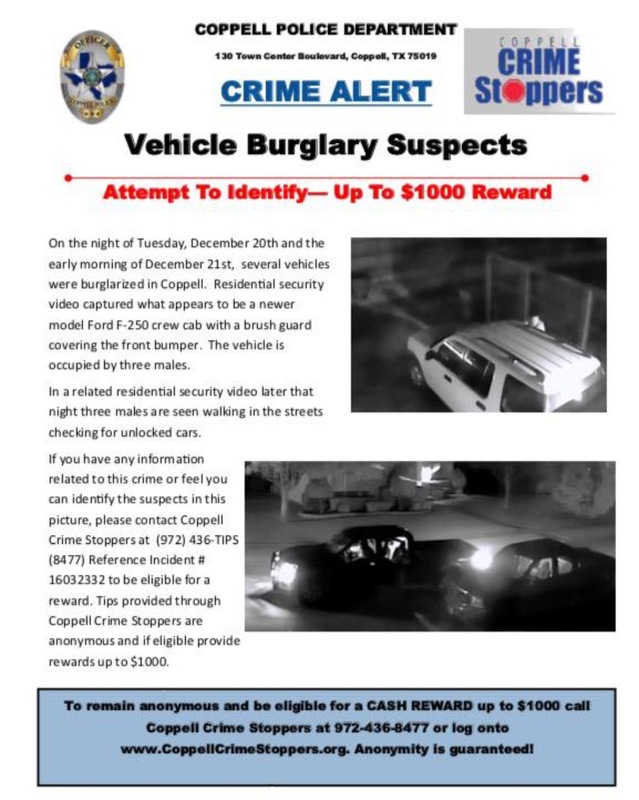 On the night of December 20th and the early morning of December 21st, several vehicles were burglarized in Coppell. Residential security video captured what appears to be a newer model Ford F-250 crew cab with a brush guard covering the front bumper. Thee vehicle is occupied by three males. 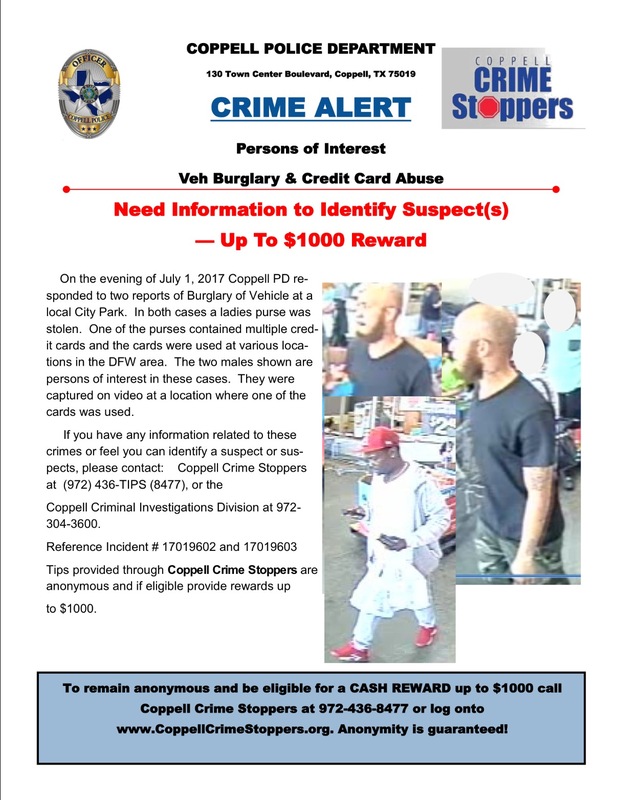 If you have any information related to this crime or feel you can identify the suspects in this picture, please contact Coppell Crime Stoppers at 972-436-TIPS (8477). On Wednesday, December 14th at 3:15am, the pictured suspect was seen walking the alleyway near Graywood Lane in Coppell. He walked up to parked vehicle and attempted to gain entry. This suspect may be involved in other burglaries of motor vehicles in the area, and we are seeking the public`s help in identifying him. On Friday, November 25th at approximately 4:30pm, the suspect drove into the victim`s driveway and removed a package that had just been delivered by UPS. The victim`s security cameras captured the suspect`s vehicle, but the images are not clear enough to obtain a license plate. The suspect appears to be a white male with blonde hair, approximately 5`4"-5`6" in height. He had a passenger in the vehicle. 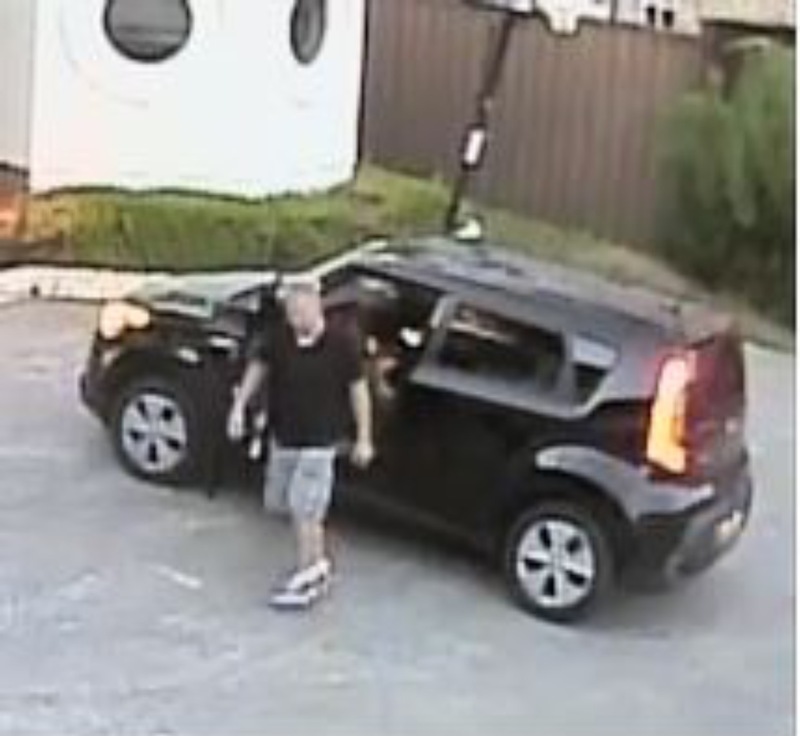 The suspect drives a black 2014-2016 Kia Soul that appears to be in good condition with no dents or scratches and has no visible bumper stickers. 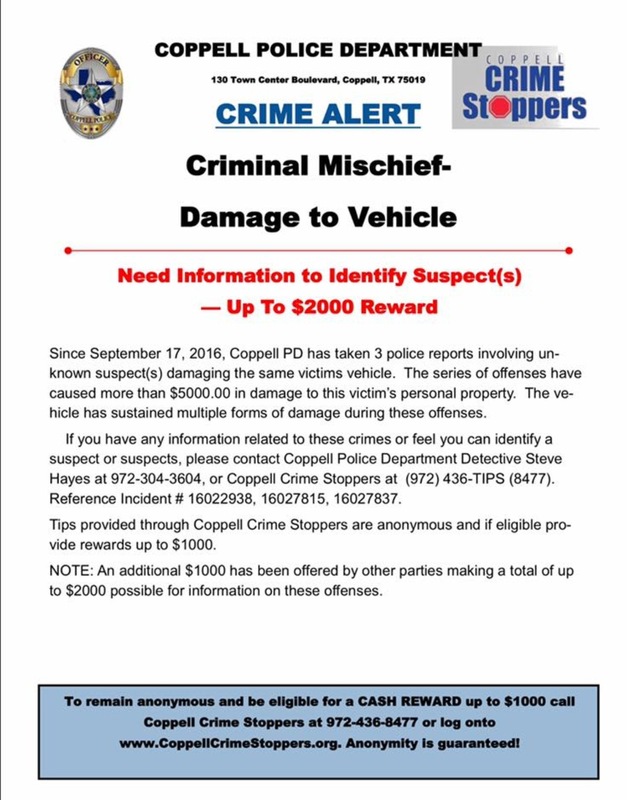 Since September 17, 2016, Coppell PD has taken 3 police reports involving unknown suspect(s) damaging the same victim`s vehicle. The series of offenses have caused more than $5,000.00 in damage to this victim`s personal property. The vehicle has sustained multiple forms of damage during these offenses. If you have any information related to these crimes or feel you can identify a suspect or suspects, please contact Coppell Police Department Detective Steve Hayes at 972-304-3604, or Coppell Crime Stoppers at 972-436-TIPS (8477). An additional $1,000 has been offered by other parties making a reward total of up to $2,000 possible for information on these offenses. 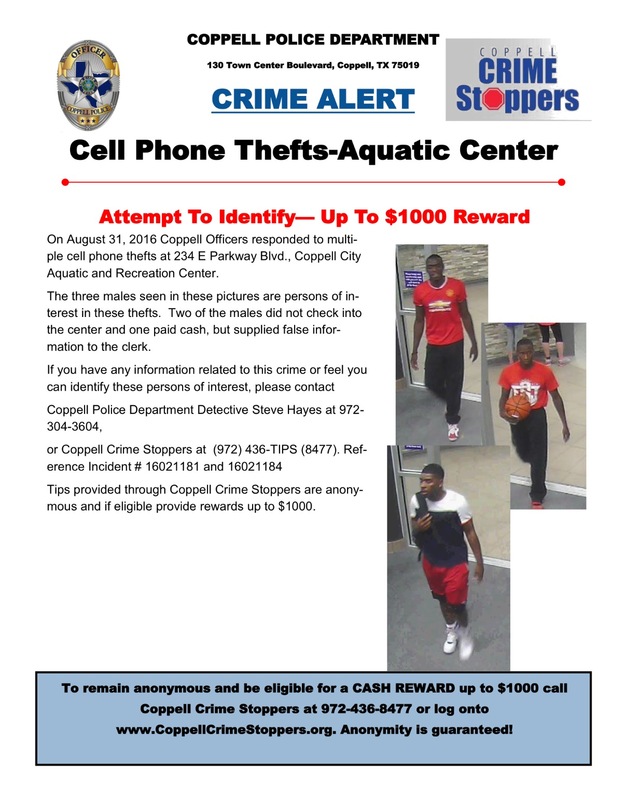 On August 31, 2016, Coppell Officers responded to multiple cell phone thefts at 234 E Parkway Blvd., Coppell City Aquatic and Recreation Center. The three males seen in these pictures are persons of interest in these thefts. Two of the males did not check into the center and one paid cash, but supplied false information to the clerk. 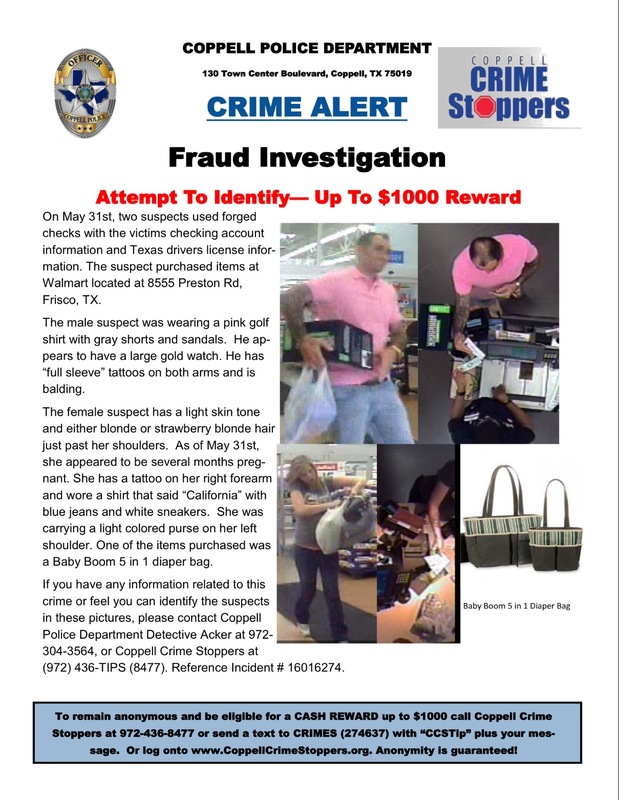 If you have any information related to this crime or feel you can identify these persons of interest, please contact Coppell Police Department Detective Steve Hayes at 972-304-3604 or Coppell Crime Stoppers at 972-436-TIPS (8477). Reference Incident #16021181 and 16021184. 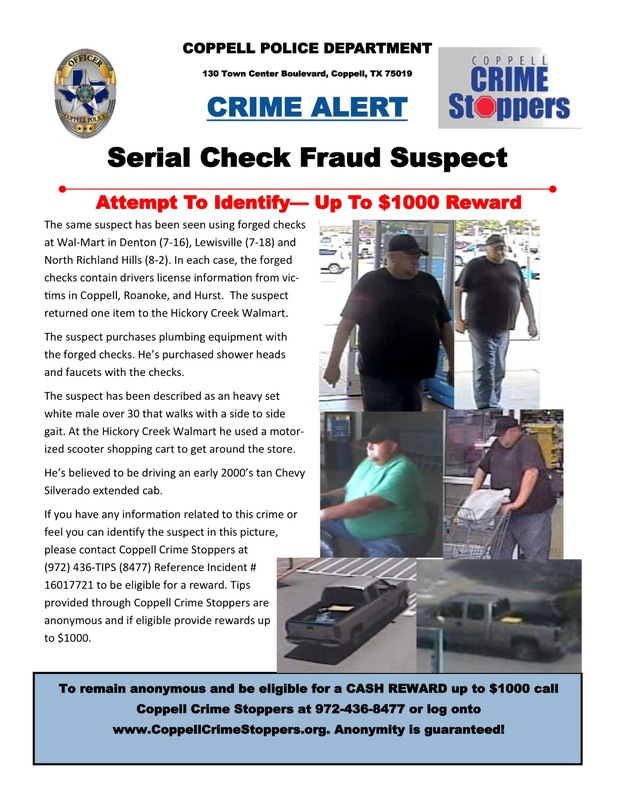 The same suspect has been seen using forged checks at Walmart in Denton (7-16), Lewisville (7-18) and North Richland Hills (8-2). In each case, the forged checks contain drivers license information from victims in Coppell, Roanoke, and Hurst. The suspect returned one item to the Hickory Creek Walmart. The suspect purchases plumbing equipment with the forged checks. He’s purchased shower heads and faucets with the checks. The suspect has been described as a heavy set white male over 30 that walks with a side to side gait. At the Hickory Creek Walmart he used a motorized scooter shopping cart to get around the store. He’s believed to be driving an early 2000’s tan Chevy Silverado extended cab. 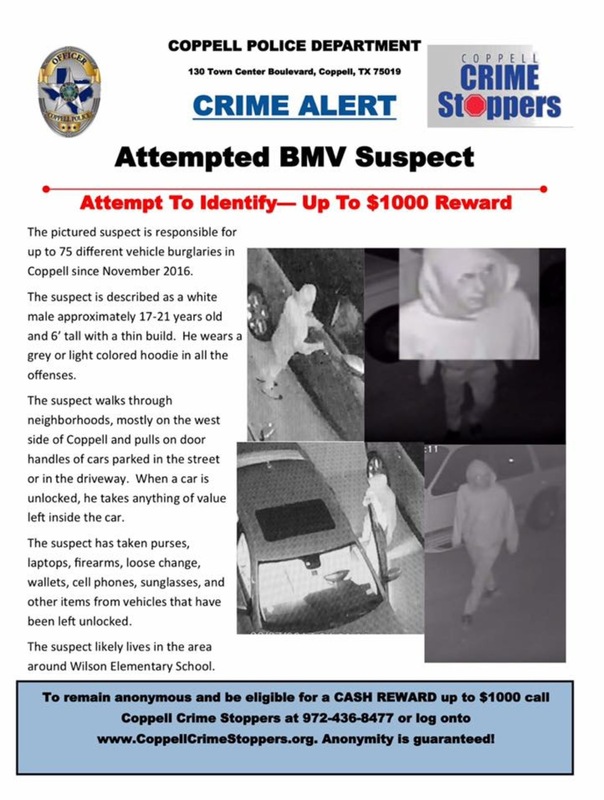 If you have any information related to this crime or feel you can identify the suspect in this picture, please contact Coppell Crime Stoppers at (972) 436-TIPS (8477) to be eligible for a reward. 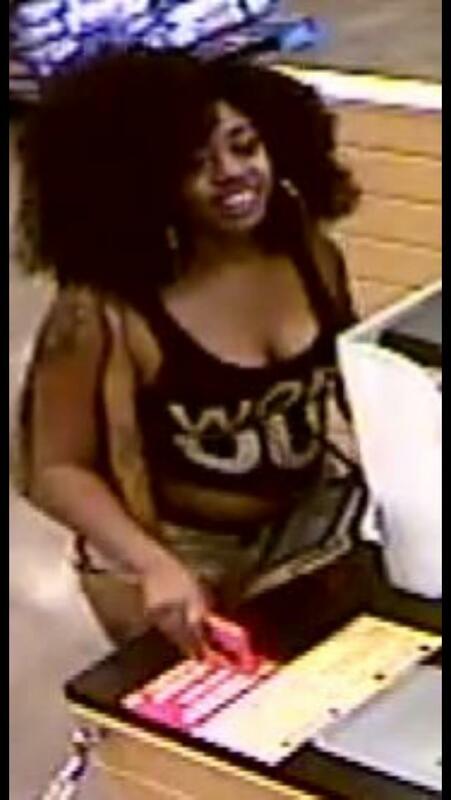 On Sunday, July 31st at 7:35 AM, the pictured suspect used a fraudulent credit card at Kroger at 950 E. Sandy Lake Rd in Coppell. The suspect also used a coupon and Kroger rewards card with his purchase. The suspect is a bald black male with glasses and wears a large watch on his left wrist. He left the scene in a silver/grey newer model Chevy Traverse. 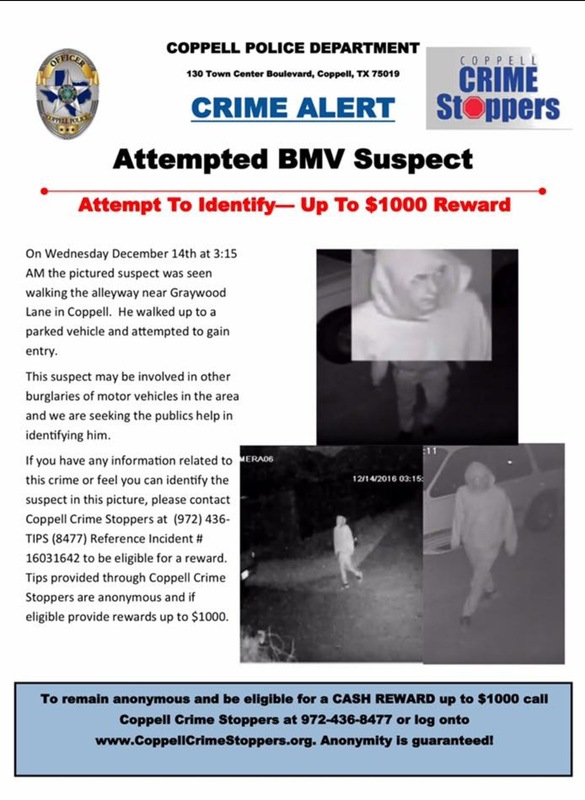 If you have any information related to this crime or feel you can identify the suspect in this picture, please contact Coppell Crime Stoppers at 972-436-TIPS (8477) to be eligible for a reward. Or contact Coppell Police Department Detective Acker at 972-304-3564. On Saturday July 16th, at 10:36 AM, the pictured suspect used two fraudulent checks at Walmart at 1515 S Loop 288 in Denton. The checks included the victim`s name and address, but the bank account does not exist. The suspect also used the victim`s drivers license information with the checks. The suspect purchased showerheads with the fraudulent checks. He left the scene in a Chevrolet or GMC tan extended cab pickup truck. 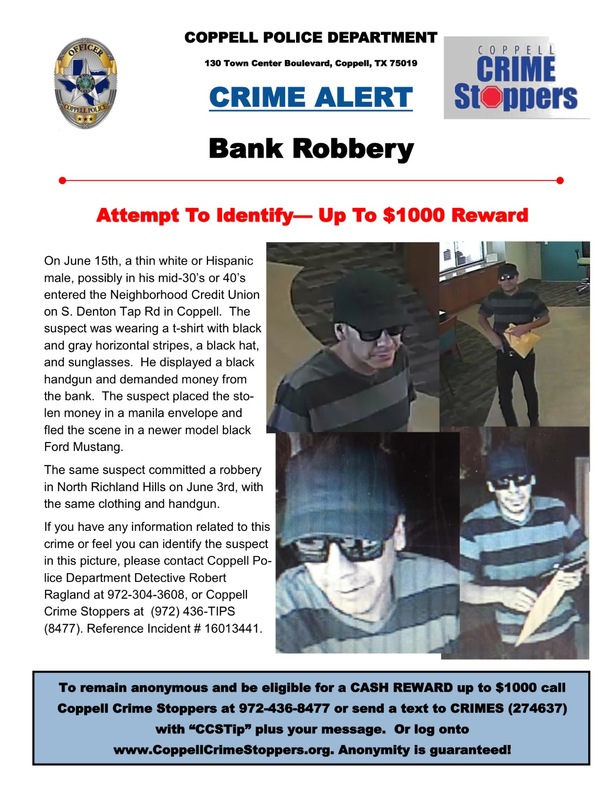 On June 15th, a thin white or Hispanic male, possibly in his mid-30’s or 40’s entered the Neighborhood Credit Union on S. Denton Tap Rd. in Coppell. The suspect was wearing a t-shirt with black and gray horizontal stripes, a black hat, and sunglasses. He displayed a black handgun and demanded money from the bank. The suspect placed the stolen money in a manila envelope and fled the scene in a newer model black Ford Mustang. 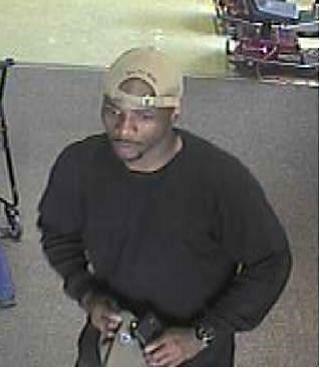 The same suspect committed a robbery in North Richland Hills on June 3rd, with the same clothing and handgun. If you have any information related to this crime or feel you can identify the suspect in these pictures, please contact Coppell Police Department Detective Robert Ragland at 972-304-3608, or Coppell Crime Stoppers at (972) 436-TIPS (8477). On May 31st, two suspects used forged checks with the victim`s checking account information and Texas drivers license information. The suspect purchased items at Walmart located at 8555 Preston Rd, Frisco, TX. The male suspect was wearing a pink golf shirt with gray shorts and sandals. He appears to have a large gold watch. He has "full sleeve" tattoos on both arms and is balding. The female suspect has a light skin tone and either blonde or strawberry blonde hair just past her shoulders. As of May 31st, she appeared to be several months pregnant. She has a tattoo on her right forearm and wore a shirt that said "California" with blue jeans and white sneakers. She was carrying a light colored purse on her left shoulder. One of the items purchased was a Baby Boom 5 in 1 diaper bag. If you have any information related to this crime or feel you can identify the suspects in these pictures, please contact Coppell Police Department Detective Acker at 972-304-3564, or Coppell Crime Stoppers at (972) 436-TIPS (8477). 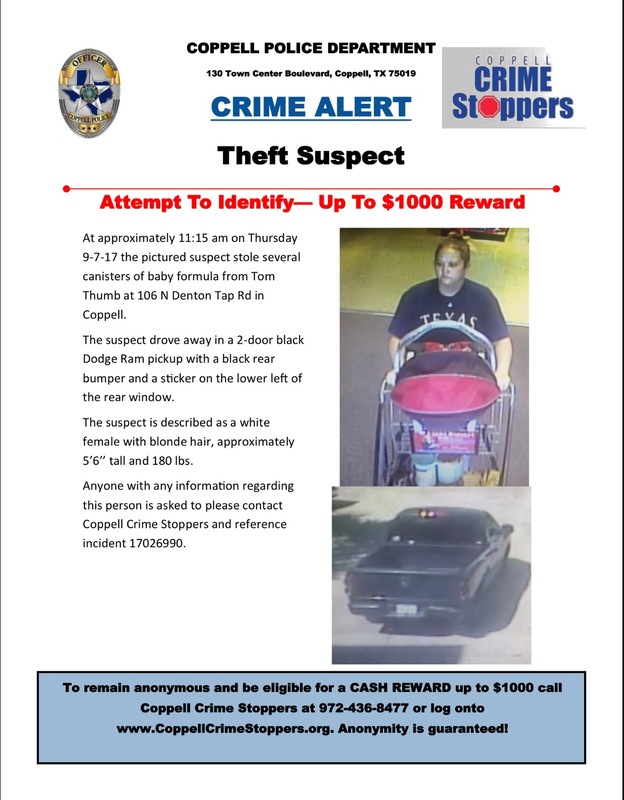 On April 18, 2016 at 5:50 PM, victim had her vehicle broken into at a local day care in Coppell and her purse was stolen. The victim`s AMEX card was used to purchase an item from a home improvement store on the same day as the credit card theft. The female in the picture is a person of interest in this case. She picked up the item at the home improvement store on April 19, 2016. The receipt appears to have false information about the purchaser and the person picking up the item and Detectives are working to identify this female in order to further this Felony investigation. If you have any information related to this crime or feel you can identify the suspect in this picture, please contact Coppell Police Department Detective Steve Hayes at 972-304-3604, or Coppell Crime Stoppers at (972) 436-TIPS (8477). On Friday, April 15th the suspect followed an 88 year old female from the bank and into the Tom Thumb located in the 100 block of North Denton Tap Road in Coppell. When the victim placed her purse into her shopping basket, the suspect grabbed the victim’s purse and fled out of the store when the victim was distracted. The victim’s credit card was used shortly thereafter at a gas station in Lewisville, Texas. If you have any information related to this crime or feel you can identify the suspect in this picture, please contact Coppell Police Department Detective Jason Acker at 972-304-3564 or Coppell Crime Stoppers at 972-436-TIPS (8477). Reference Incident # 16007274. 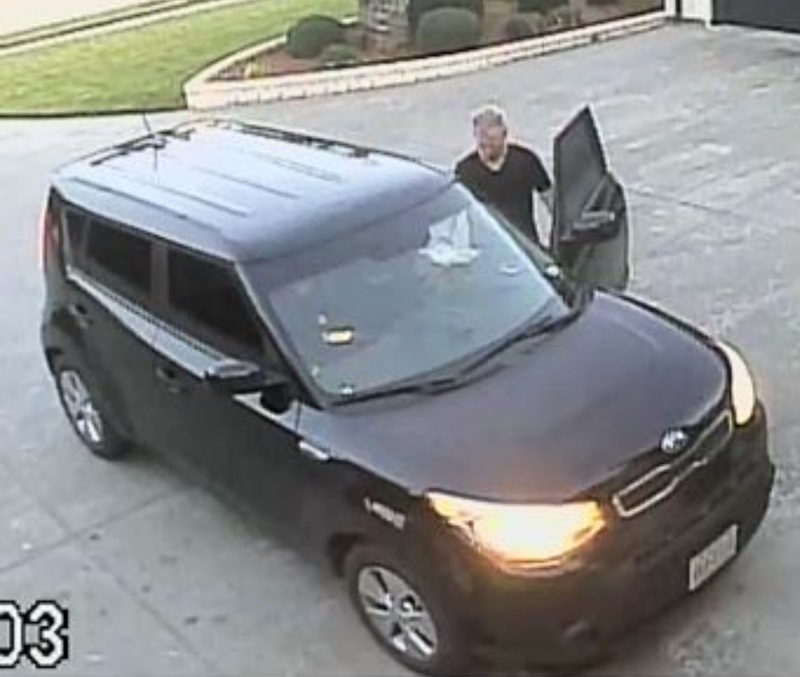 On Tuesday, April 12th, several suspects entered into multiple unlocked vehicles on the West side of Coppell. The suspects moved along the street checking doors while the suspect vehicle drove along with them. As pictured to the right, the vehicle appears to be an early 2000 Infiniti G35. The vehicle is a white four door, with black accent pieces. It also has a rear spoiler and a sunroof. 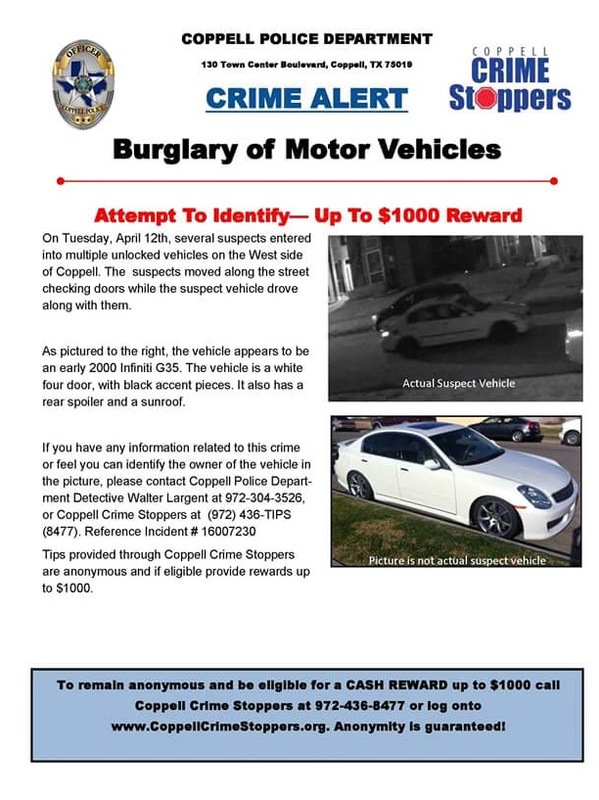 If you have any information related to this crime or feel you can identify the owner of the vehicle in the picture, please contact Coppell Police Department Detective Walter Largent at 972-304-3526, or Coppell Crime Stoppers at (972) 436-TIPS (8477). PUIG, Jorge Ingoica, W/M, 59 YOA, 5`7" 200 lbs. Vehicle has a chrome package, sun roof and is missing at least 1 center cap on the front passenger side tire. If you see this person or know his whereabouts, DO NOT try to apprehend. Please contact Crime Stoppers at 972-436-TIPS (8477). <?xml:namespace prefix = "o" />Up to a $1,000 Reward available. Tips can be anonymous.